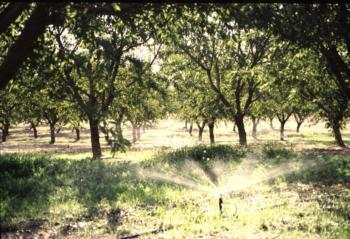 Microsprinkler irrigation in a walnut orchard. Photo: L. Schwankl. In evaluating a microsprinkler system, there are two main items of interest: (1) the average discharge rate for the microsprinklers, and (2) the variability of microsprinkler discharge rates. Luckily, collecting a single set of field data can help you determine values for both items. Two ways to determine whether a microirrigation system is experiencing clogging problems are (1) either install a flow meter on the system as a whole or install a smaller flow meter on several lateral lines and (2) collect discharge from a sample of microsprinklers from throughout the microirrigation system. An advantage to using a single flow meter at the head of the microirrigation system is that it collects information over a period of time. A disadvantage is that even if the flow meter can help detect a problem such as clogging (by indicating a decrease in flow rate over time), a single flow meter gives you no information about where in where in the system you are likely to find (and remedy) the clogging. Flow meters on lateral lines are better able to detect clogging than a single, large flow meter at the head of the system and they cost $100 or less each. You will need to install multiple lateral line flow meters throughout the system in order to get an accurate picture of what is happening. When you collect and measure the water discharged from a sample of microsprinklers in your system, you can end up with good information on where clogging may be occurring in the system. There are some disadvantages to this approach, though: for instance, it only gives you a snapshot in time and you have to be present in the field to collect the information. If you need to determine whether and where emitters are clogging, testing a sampling of microsprinklers is the best approach overall. The two approaches - flow meters and microsprinkler sampling - are not exclusive of each other. They can be used together on a microsprinkler to provide greater information.